Louis Lefebvre, McGill University, Québec, Canada. "An integrative approach to animal innovation: from ecology to neurotransmitters"
Some animals are opportunistic and respond to environmental change with flexible behaviour, while others are conservative and do not easily adapt to change. One way to operationalize this continuum is to quantify the number of novel foods and feeding techniques that animals use, corrected for all possible sources of bias. An integrative approach to this has several levels. First, it examines the phylogenetic distribution in as wide an array of animals as possible of the trait to assess the relative roles of common ancestry and independent convergent evolution. Second, it looks for all possible behavioral, ecological and life history correlates of this distribution to identify selective contexts, trade-offs and syndromes. Third, it identifies the neural mechanisms of innovation and its cognitive correlates at the level of brain area expansion, neuron numbers and neurotransmitter expression. Finally, ecologically relevant experimental proxies are validated to examine in the wild fitness differentials associated with innovative behavior. 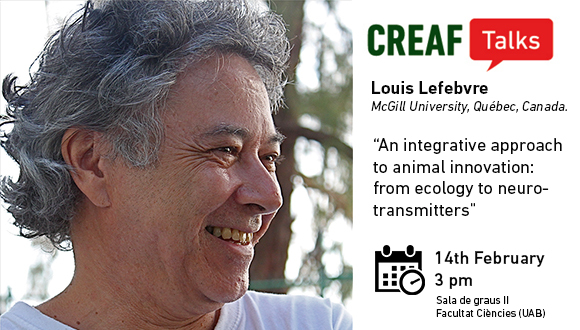 Louis Lefebvre is professor at McGill University (Québec, Canada) and did his postdoc at Oxford University with Prof. Richard Dawkins. His research focuses on the non-genetic means by which new behaviours originate, are maintained and are transmitted in animal populations. Innovations, learning and cultural transmission are studied in the field, in captivity and with data from the literature. Most of the research is on birds; field work is conducted on nine avian species out of the Bellairs Research Institute of McGill University, Barbados, and on feral pigeons in Montréal. Our free seminar programme is open to everyone.